Yarom Polsky’s diverse background in private and public-sector research has given him a knack for recognizing opportunities to advance the state-of-the-art, and he parlays that knowledge into successful innovation as an engineer, group leader, and program manager at Oak Ridge National Laboratory. 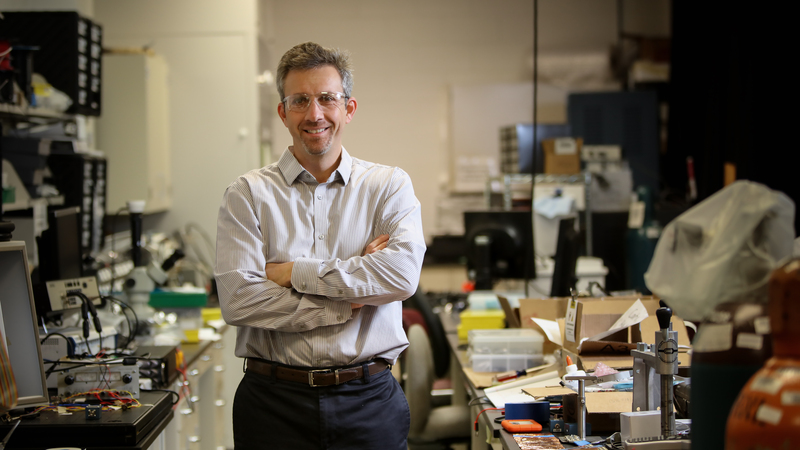 As leader of the Sensors and Embedded Systems (SES) Group in the Electrical and Electronics Systems Research Division, Polsky oversees staff developing sensing and measurement technologies for a wide variety of applications. “We’re all about quantifying how the world works and then finding a way to control it for the best outcome,” he said of the group’s work. His personal research has ranged from using neutron imaging to understand fluid flow in geothermal systems, to applying diffraction techniques to measure the strain inside rocks. Polsky also manages the Geothermal Technologies Program and co-manages the Fossil Energy Program at ORNL. Polsky’s interest in the subsurface environment and controls technologies began with his first job out of grad school at oil and gas services firm Schlumberger, where he and his fellow engineers developed specialized equipment for well completion and maintenance. One of the companies’ priorities was updating its oilfield services equipment with automated controls, Polsky recalls. He led the development of several equipment suites with advanced, data and communications-rich control systems replacing conventional hydraulic control systems. He later parlayed that experience into work in a related subsurface application area at Sandia National Laboratories. There, Polsky led or participated in several projects in geothermal energy extraction, conducting both fundamental and applied product research. He developed advanced models for a drilling simulator, designed and developed drilling technologies, and conducted multi-physics modeling, simulation, and analysis in support of subsurface research. Polsky first came to ORNL in 2009 as an engineering lead for the accelerator at the Spallation Neutron Source, a US Department of Energy Office of Science user facility. His background in mechanical design and engineering and physics and a keen interest in being involved in the startup of the SNS were key attractors for the researcher. He designed and developed components for the accelerator and performed analysis for design and operations. He later took on the role of manager for laboratory-directed research and development (LDRD) in the Office of Institutional Planning at ORNL for two years before again getting into research himself and taking on the job of group leader in 2013. Polsky credits those experiences for his depth of knowledge regarding the lab’s expertise and capabilities. That background has been essential as Polsky donned another hat at the lab last year, leading a Technologist-in-Residence program with Pioneer Natural Resources in which ORNL identifies research opportunities that could aid the Texas-based unconventional oil and gas producer. Polsky enjoys bringing together multidisciplinary teams of researchers at the lab to solve interesting challenges. Another effort he is currently leading, in fact, is gathering expertise from various corners of the lab to propose clean water science and technology solutions. “This is a great problem for us to tackle as a national lab. Our origin was focused on the greatest separation science challenge of the time. We still excel in separation science, but have diversified our mission and capabilities, and now have an even broader range of world-class science and technology expertise that is directly relevant to this topic,” he added. Like many scientists and engineers, Polsky recalls a childhood desire to understand how the world works. His father was a medical doctor who encouraged his son to make his mark in the science field. Polsky enjoyed math and science growing up, and he later earned a bachelor’s degree in physics at Rice University. Polsky opted to pursue a graduate degree in mechanical engineering at Rice after hearing about all the things he could do in the field from a professor at the university. He earned a PhD in mechanical engineering at Georgia Tech, and along the way completed an internship at Intel—a first experience in the business world that helped guide his later career choices. Polsky has a strong interest in helping guide the next generation of scientists, and encourages colleagues as well as the interns and students he mentors to look to the future to guide their professional pursuits. “What’s unique about the national labs is that you have an opportunity to direct the research agenda. It’s very different in the corporate environment, where you will work on whatever the business units have determined to be the most important technology or research environment,” he said.